Refer to photos 1-3. CLICK ON THE THUMBNAIL FOR AN ENLARGEMENT. 1. The first thing I needed to do was make the belt worn over the coat. I rolled out a snake of AVES putty and flattened it out to an even thickness. It was then trimmed using a small ruler. 2. 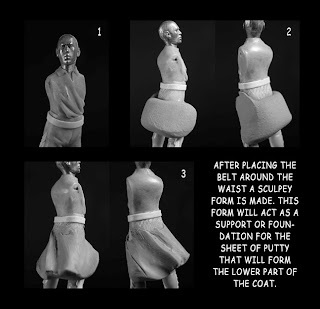 A form that will support the sheet of putty that will become the lower coat was made using Sculpey. Typically sculptors add a partially cured sheet to the area and manipulate it as it's curing. The Sculpey form not only supports the putty but allows you work in a fold pattern that looks more natural. Using sheets of putty to represent coat tails, capes, or flags are often used to add drama to a piece. A lot of the time these additions lack life and end up looking like sheets of putty painted to look like a coat tail or cape. 3. The completed Sculpey form with major folds worked into the Sculpey. Before adding the sheet of putty the form was given a very light coating of Vaseline so it does not stick to the putty.